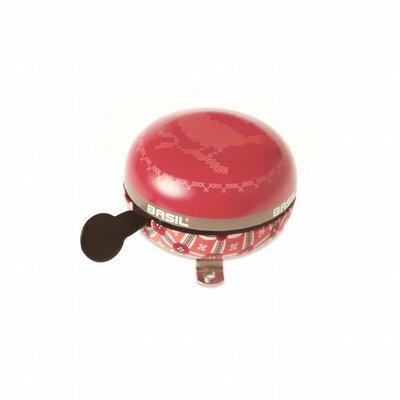 The Basil Big Bell Boheme is a stylish red bell ding dong with bohemian print. The Basil Big Bell Boheme is a red ding dong bell with elegant bohemian print. This bubble has a diameter of 80mm and a resounding ding dong sound. A group of cyclists overtaking you go down much easier this way, because to this one bell can go. The Basil Big Bell Boheme is also available in blue, green and black. This bike accessory is part of the Basil Boheme collection. There are bicycle bells, but also saddle sleeves and a variety of panniers are available for front and back of your bike. Are you curious? View Basil Boheme collection here. Stylish bike accessory for your bike by bohemian print. Makes a resounding ding dong sound.